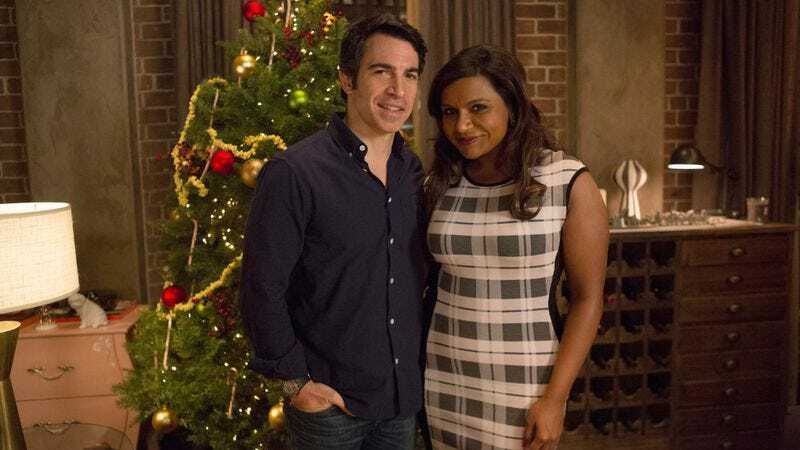 With “Christmas,” The Mindy Project is three-for-three within the tricky category of holiday episodes. We shouldn’t expect any less from Mindy Kaling, the kind of romantic fool the holidays were made for. While “Christmas” highlights all the utilitarian elements that make the show so worthwhile (the staff meeting scene could have taken place during any week, any episode, but it’s about my favorite 90 seconds of the season so far), it adds season three’s secret weapon—the emotionality of Danny and Mindy’s relationship—to deliver us all a holiday wallop we’ll need the break to recover from. It’s an embarrassment of punchline riches, really: The batting average of jokes that actually land, and land solidly, in this episode is the highest it’s been all season. But our romcom heroine knows what the folks really want at Christmas, so she and Grandy also offer us three separate romantic storylines. Can we ever have envisioned a world in which Morgan Tookers is a heartthrob? His mistaken identity hookup with Jessica offered not only some welcome Peter-Morgan bonding, but a chance to see Morgan with an attractive someone who is possibly as messed-up as he is. I’ve really come around on Ike Barinholtz’s character right around the time he started dating Danny’s mom, and his payoff with Jessica is well-earned. The absence of his ex Tamra is a bit mysterious, although I assume it’s because she would have gotten in the way of the romantic storyline. Still, we could have used a line explaining her absence. Another deserved payoff: Peter as a grownup. He’s paying his rent on time, looking to date again, helping Danny figure out what Mindy really wants, even letting Morgan get the girl. It makes sense that this would be around the same time that Lauren gets a bit bored with stuffy Jeremy and remembers all the reasons she likes Peter: the fun involved with deceiving people at a party, they’re both Christmas haters, and he actually likes her kid. Sorry Jeremy, looks like game over. But the raw emotional center of “Christmas” is Mindy’s devastation over not getting the fellowship, and Danny’s machinations to both stop her efforts and then help them at the end. Mindy Kaling really doesn’t get enough credit for being able to sell a line like “If it wasn’t for him, I’d be covered in Simpsons tattoos” and then show her devastation over the loss of the fellowship within the same episode. Showing more of Mindy on the job has been another helpful development this season, so if Danny is not stepping up, we know that she needs to take care of herself and move ahead with her life. Danny’s refusal to step up is still rather a mystery, and I don’t buy that he would be quite so clueless as to make a big deal at dinner about his burial plot, especially after Mindy just received the awful apartment fakeout last week. (Although I loved Mindy demanding the dessert menu in response.) But there’s no mistaking when Danny realizes how wrong he’s been: when he sees Mindy’s awesome, Ken Burns-inspired documentary (and possibly the show’s best-ever use of a stunt casting). By viewing her celebration of his inherent nerdiness, and the reading of the letter he sent her in Haiti, Danny realizes that Mindy really gets him. Fortunately, Annette is absolutely right when she tells Danny to get Mindy the fellowship instead of the ring, so his gift to her is the letter that will get her to Stanford (with a detour at the hilarious all-female nativity scene). It’s a classic Gift Of The Magi twist: By giving Mindy what she really wants (the fellowship), Danny is also losing something he really wants (having Mindy around for the next eight months). It’s also a high-stakes plot twist, because a lot can happen in eight months, so Mindy and Danny’s relationship may be majorly different when the show returns in a few weeks. But The Mindy Project has garnered a lot of goodwill this season, so that we can have enough trust that the show will still land in a good place when it returns in January. It’s ending 2014 as it’s ended so many episodes this year: on an absolute high note. I also appreciated Morgan’s reference to the fantastic dance Danny gave Mindy last year for Christmas. Wreath Witherspoon is the nicest thing in Danny’s apartment. Hoarder Jessica takes a large plastic snowman with her when she storms out of the party. When Ken Burns calls you a nerd, you’ve reached a whole new level of nerddom. Danny’s credit card: Catholic Rewards. Mindy’s best outfit, maybe ever: Lots of nice ensembles this week, but come on, that holiday party dress (above) was absolutely stunning. Mindy Kaling should wear that on the red carpet. Have a great holiday, everyone! See you in 2015 when The Mindy Project returns with “San Francisco Bae” on January 6.